* Gombe United FC will most likely finish the Nigeria Premier League 2012 mid-table. The Scorpions have struggled with injuries parts of the season and based on their strong squad, fans of the club should be a bit disappointed with their overall performances. Veteran goalkeeper Ahmed Yusuf is first choice between the sticks after Uche Akubike (born 17.03.1980) was transferred to Enyimba FC during the mid-season transfer window. Teenage goalkeeper Umar Maijalingo, who joined the Scorpions from the Yarmalight Football Academy, has gotten some playing time lately. Maijalingo trained with the Nigeria U-17 national football team earlier this year. Gombe United FC has several quality defenders, including Maurice Chigozie, George Chinwuba, MacMarcel Obioha, Ola Ogundele and Timothy Simon. Obioha, a tough central defender, was training with the Super Eagles, the Nigeria national football team, in May 2012. The midfield is run by experienced performers such as Austin Ekpoma (born 01.08.1991), Manu Sunday Gidado and captain Alhaji Kwairanga (born 28.12.1987). Ekpoma has scored seven goals so far this season. A couple of rather unknown players have partly broken through this season, including midfielder Ifeanyi Ezeugwu and Mathias Samuel. Youngster Mustapha Babadidi scored nine goals before he was badly injured in March 2012. Babadidi has just returned to training and several European clubs are apparently monitoring the talented striker. Babadidi was supposed to be training with the Super Eagles in April 2012, but had to turn down the invitation due to the injury. Babadidi’s striking partner Sanusi Sani is top scorer for Gombe United FC with 11 goals. Sani played for Nigeria B against Niger B on 15.08.2012. * Nigerian football is pretty hard to predict. When Kano Pillars FC signed central defender Umar Zango from Lobi Stars FC before the season, few would have thought the veteran would force his way into the Nigeria B national football team. Zango has been instrumental in the heart of the Pillars defence and played for Nigeria B against Niger B on 15.08.2012. According to 2muchsports, Zango is born 10.11.1985. * Imenger Barnabas of Kwara United FC has joined Swedish second level side Trelleborgs FF on a loan deal. I have previously written that Barnabas is most likely born in 1992 but it turns out that he is born 24.11.1991 (source: svenskfotboll.se). To be honest, I had thought Barnabas, who scored five goals during the Nigeria Premier League 2012, would be able join a better team. Hopefully, the Swedish outfit will be a stepping stone for the talented striker. I have previously written that Agbim is born in 1984 or on 20.08.1984 but I will now officially use 28.11.1984 as his correct date of birth. Egwuekwe’s birthdate is the same birthdate that was published by 2muchsports during the Nigeria Premier League 2010-2011. MTN Football has previously suggested that Gabriel is born in 1991 and a Japanese website, which I don’t trust, has previously written that Gabriel is born in 19.11.1985. Personally, I think 25.09.1990 makes a lot of sense and I believe FIFA has the correct one. The same birthdate was published by 2muchsports and a Norwegian club I helped a few months ago, who had received a CV of the player with the birthdate 25.09.1990. The birthdate of Idris, who turned 23 some weeks ago, Mba, who will turn 24 in November, and Nwachukwu, who is 20 years old, has been known for years. I have previously written that Oboabona is born 16.08.1990 but it turns out that I missed with a month. I will use the birthdate 16.09.1990 in the continuance. Both FIFA and 2muchsports agree that Oshaniwa is born 14.09.1990. The official website of Enyimba and FIFA agree that Uche is born 18.08.1990. In October 2010 I wrote that Uzoenyi was 22 years old. 2muchsports has published the birthdate 23.03.1988, which I found likely based on his trials in Norway, his broad experience in the Nigeria Premier League (Uzoenyi played top level football for Enyimba FC as early as 2007 and featured for Gateway FC before that) and his performances for the Nigeria U-15 and Nigeria U-20 national football team. It is a fact that Uzoenyi was the big star of the Nigeria U-15 national football team in April 2002: http://allafrica.com/stories/200204230700.html. Based on the above, I was very surprised to read that Uzoenyi is born 23.03.1992. But as always, you never know with Nigerian football. * Left-back Benjamin Francis is having a breakthrough season at Heartland FC. Francis, formerly of Plateau United FC, Nasarawa United FC and Niger Tornadoes FC, played for Nigeria B against Niger B on 15.08.2012. * One of main reasons behind the success of Kano Pillars FC has been the midfield partnership of Reuben Gabriel (born 25.09.1990) and Musa Mustapha (born 26.08.1990). A couple of days ago, Gabriel was interviewed by SuperSport and explained that Mustapha had effectively played as the more defensive of the two, allowing Gabriel to frequently join the attack. Gabriel has played eight full international matches (one goal) for the Super Eagles so far in 2012. In fact, Gabriel plays even when Nigeria is using their professional players. * Obadaki Halilu (born 20.12.1993) is a promising left-back at Kwara United FC. Halilu, formerly of Ranchers Bees FC, is a skillful defender. 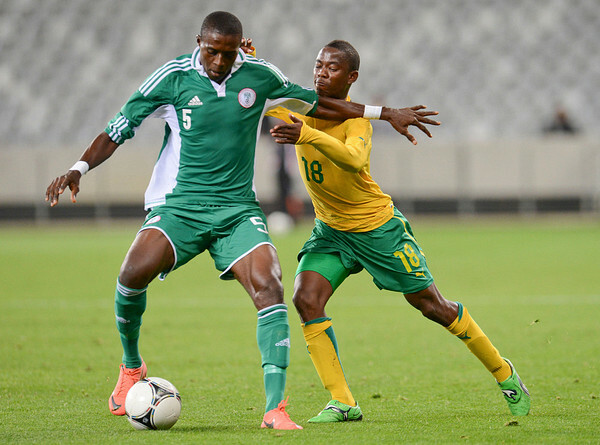 In July and August 2012, Halilu was training with the Nigeria U-20 national football team. The current season is Halilu’s third at Kwara United FC. * Towering striker Alhaji Gero (born 10.10.1993) is currently the big star of the Nigeria U-20 national football team. Gero, who plays for Rangers International FC, scored a total of three goals when Nigeria U-20 won both matches against Tanzania U-20 during the 2013 African Youth Championship qualifiers in July and August 2012. Gero is a hard-working, tall striker who has scored two goals during the Nigeria Premier Leauge 2012. His commitments for Nigeria U-20 have reduced the number of matches for Rangers this season, possibly explaining the relatively low number of goals scored. Gero joined Rangers from Kaduna United FC in April 2012. * Fredrick Obomate, the defender who played for the Flying Eagles on 27.05.2012 against Argentina U-20 in the Cape Town International Challenge, has now made his official debut for Sharks FC in the Nigeria Premier League. I can also confirm that Abonima Izuegbu (born 27.11.1994), who played all three matches during the Cape Town tournament, is playing for Sharks FC. Abonima, formerly of 36 Lions FC, is primarily a central defender or defensive midfielder. The picture is of Izuegbu and was found on imagesa.photoshelter.com. * “The word on the street” is that striker Aaron Samuel is on his way to Norwegian top level club Vålerenga IF. Samuel, formerly of Dolphins FC and Shooting Stars FC, is a big striker who has been training with the Nigeria U-20 national football team a couple of times this year. Samuel was not a success at 3SC and failed to score a goal for the club before he left during the mid-season transfer window. Please note that this is only a unconfirmed transfer rumour. * Sometimes, going down a level can be a good career move. Fidelis Saviour (born 18.04.1988) scored three goals for Kaduna United FC during the Nigeria Premier League 2010-2011, spending most of the time in the shadow of top scorer Jude Aneke. Saviour decided to join second level side Ranchers Bees FC and scored four goals for the Kaduna based club. During the mid-season transfer window, Saviour joined ambitious FC Taraba, where he scored another six goals. Saviour scored a total of 10 goals during the Nigeria National League 2012, making him top scorer at second level of Nigerian football. A few days ago, Saviour was rewarded for his fine season by being picked for a Super Eagles training squad. * On 23.08.2012, striker Abdulrahman Bashir scored his 14th and 15th goal of the season for ABS FC. I doubt that ABS FC will be able to hold on to their star player for the up-coming season. * Jonah Usman of ABS FC is one of the most promising goalkeepers in Nigeria, currently backup goalkeeper at the Flying Eagles, the Nigeria U-20 national football team.